FROM MY PREVIOUS POST, I described my personal/emotional involvement with the subject of this project. Before I even knew I would be slapped in the face with Depression, I had always been curious about more conceptual themes of design. In third year at Emily Carr University, as I watched my peers wrestle with their graduation projects, I spent time filtering through existing designs which exemplified what I wanted to achieve with my own project. When I initially started thinking about themes to consider for my grad project, I looked into grieving rituals. I looked at my family’s traditions as to how we honour those who have passed and began some research when I found this. 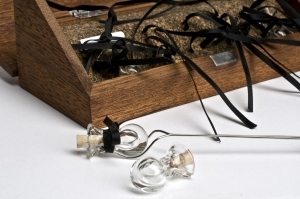 Single Tear Catcher honours a moment by capturing a tear in a vial; the vial is sealed with a cork and housed in a box with black ribbon with a scroll to write important details of significance. This object was inspired by a solitary tear shed when the designer attended a funeral. Matt Coombes looks to provoke discourse about grief with a collection based on experiences with grieving. He uses personal narratives as means of informing the objects for the collection. His integration of playfulness for what seen as a hushed subject matter, exudes the power of design. I stumbled upon this seemingly simple pencil case on NotCot only to discover a cathartic functionality. The graphite in this set of pencils is substituted with cremated remains (the human body can produce 240 of carbon ash) which can be sharpened in the pencil case. 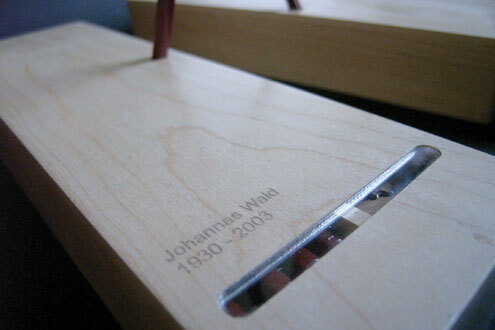 As the pencils are sharpened, the remains return to the case, acting as an urn. Only one pencil can be taken at a time, but there are enough to last a lifetime. Nadine Jarvis‘s work poetically speaks about post mortem rituals and challenges social conventions surrounding death and grieving. Her ability to speak about taboo subjects in a provoking manner has captured my imagination, and enticed the element of engaging discourse within my practice. If you ever graze through Core77’s blog, you may have crossed the hilarity that is Design Fancy, a collection of biographies dedicated to fictional designers and their fictional designs. Perhaps you have read about Thomas Ruby, the controversial designer behind “TuneDrink”, a device which uses particle spectrology to create alcoholic drinks via sound waves. My personal favourite is the entry about Quebecois Cyprien Côté, who expressed his love for all natural things with his designs. 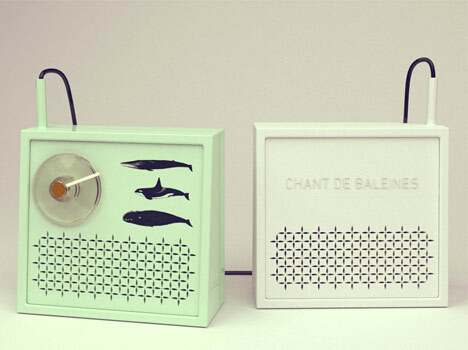 His first creation was “Chant de Baleines”, a whalesong radio that can tune in to majestic whales from around the world. Matt Brown‘s sense of humour and fun compelled me to evaluate the power of narrative. His stories and designs are so convincing and entertaining that it is difficult to believe these are not real. This whimsy and curiosity reminds me why I love design in the first place.